Get high-speed printing and enhanced productivity for your small work team with the WorkForce Pro WF-4720 all-in-one printer. Powered by revolutionary PrecisionCore technology, the WF-4720 delivers Performance Beyond Laser and print-shop-quality prints with laser-sharp text. Featuring the fastest color print speed in its class (1), the WF-4720 blazes through professional-quality documents. And, it’s economical, offering up to 50 percent lower printing costs vs. color laser (2). Its 250-sheet paper capacity means you’ll reload paper less often. Plus, it features a 35-page Auto Document Feeder and auto 2-sided printing. Combining powerful performance with a compact design, it offers outstanding efficiency. † Black and color print speeds are measured in accordance with ISO/IEC 24734. Actual print times will vary based on system configuration, software, and page complexity. For more information, visit our official site. 1. 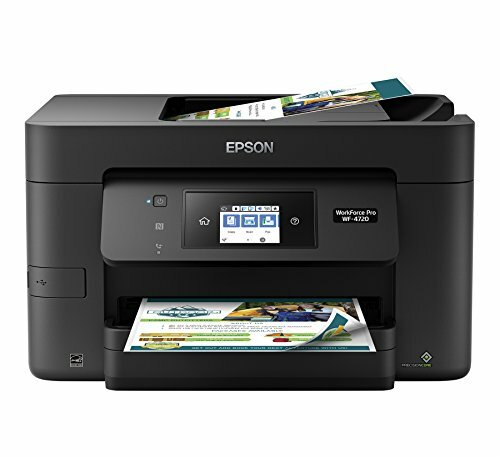 Compared to best-selling business inkjet printer models priced under $180. Competitive data gathered from manufacturer websites and third-party industry sources as of July 2016. 2. Up to 30 percent (WF-3720) and up to 50 percent (WF-4720/WF-4730/WF-4734/WF-4740) compared with best-selling, color laser multifunction printers priced at $299 (USD) or less, as of August 2016. Calculation based on continuous printing with highest-capacity individual cartridges sold in retail. Actual savings will vary based on print task and use conditions. 6. Requires an Internet connection, a free Epson Connect account and a destination email address or cloud storage account. For a list of supported cloud services, visit our official site. Get Performance Beyond Laser - the WorkForce Pro WF-4720, powered by PrecisionCore. Fastest color print speed in its class (1) - get enhanced business productivity with speeds of 20 ISO ppm (black) and 20 ISO ppm (color) (†). Economical - up to 50 percent lower printing costs vs. color laser (2).